At the end of 1989 I was contacted by Dr. Jan Kok, ophtalmologist at the AMC (Academisch Medisch Centrum/Academic Medical Centre) in Amsterdam. He asked me to develop a technique to treat patients with a damaged cornea. There was a great demand for, cause there was a big group of patients who seemed to be “therapy-immune”; all adequate existing treatment possibilities failed. In 1990 I could start to do my scientific research in the AMC. My main subject was the treatment with and safe use of colour pigments. After 4 years of scientific research I found out that the black and brown pigments were safe and they had all the requirements needed. Histopathology, EM-microscopy, X-ray micro-analysis and bacteriological research showed little risks. We published our results in a scientific paper in ‘Cornea’ (1994, 13:349-353).Our next step was to explore if other colour pigments (i.c. blue, green and yellow) could also be used for tattooing the cornea. And indeed, in 1995 we found out they were safe too and they could be used for external keratography treatment as well as for applying colour pigments within the stroma of the damaged eye. Eddy van der Velden and Jan Kok, the founders of present-day keratography. X-ray micro-analysis of pigments examination. 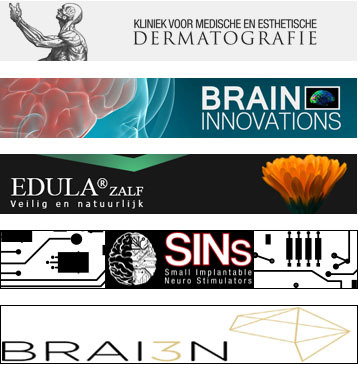 From 1995 until 2008 I worked in the Eyehospital Rotterdam (Oogziekenhuis Rotterdam) were I made a selection of therapy-resistant patients and used a new technology which was never used before anywhere in the world, the so-called Lamellar Intrastromal Keratography (LIK). The treatment had to take place in what we call the “grote OK”, the “big Operation Room”, because it needed full anaesthesia. After the operation it was necessary to keep the patient in the hospital for 2-3 days, to diminish the risk on complications. The first patient ever in the world we operated using LIK was a 45 year old man who had a severe form of photophobia and who missed an iris after an eye-accident (post traumatic aniridia). This patient couldn’t bear intraoculair implantation of the lens, nor a soft bandage lens in colour. With a trepan we made a 300 µm cutout in the cornea with a circumference of 4 – 4,5 mm. We removed the tissue, to put it back after the treatment. With a Beaver-knife we then created free space in the cornea at a depth of about 0,4 mm, to bring in the colour pigments in the stroma of the cornea. The colour pigments were mixed in site and fit as much as possible to the other eye of the patient, which was blue. We put back the removed tissue of the cornea and fixed it with 4 little stitches. The eye directly after surgery. The same patiënt 1 year post-surgery (LIK). The eye, but seen through another method by the split lamp. One hour after the operation in the “big Operation Room” (grote OK), the patient was able to open his eye without suffering from photophobia. As post-operative medication we gave the patient eyedrops of gentamycine and dexamethasone for the following 4 weeks. We removed the stitches after 3 weeks. After 1 year we had a follow-up to see if the colour pigments were still on the right place in the cornea. 24 hours later we could make the first pictures, including some with a slit lamp, which is the best way to prove whether you see any light coming through the central and the corners of the cornea. To be perfectly clear: many patients with a damaged cornea (leucoma cornea, photophobia, aniridia etcetera) often don’t have deviations concerning their sight. In other words, their visus can be normal. 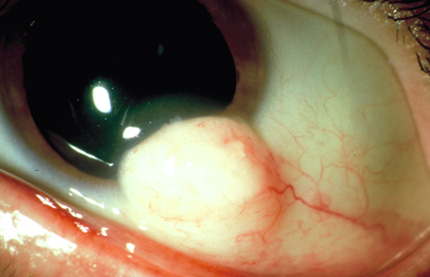 Other patients, with a severe damaged cornea, might have a sight of just a few percent. They only see a faint shimmer and some dark-light differences. The last group often has headache complaints. During the first consultation the eye doctor / practitioner will discuss with you what is the best treatment in your specific case. ● Remove the dermoid (which looks like a cyst). ● At the same time, keratographically colour that part of the iris where the dermoid had grown. For this we used the microscope. Directly after removing the dermoid. Post-surgery, 2 months after removing the dermoid and treatment with dermatography. For the operation, performed with full narcosis in the “big Operation Room” (grote OK), we first had to adjust a special instrument, a so-called “dermatoom”. This is a cutting machine that can be configured very accurate on the thickness of microns. With this machine we had to remove the dermoid in one cutting move. We did successfully, and when the bleeding stopped we immediately started colouring the iris, using three conical needles with a diameter of 0.36 mm. Those needles are even more fine than the ones normally used. The patient stayed in hospital for 3 days for observation and he got 5 times a day drops of antibiotics, three weeks long. All went well and without any complication. The follow-up was 2 years after the operation.